UPDATED: JAN 26, 2019 Hazy orange colour with an average head. Malty, piney, resinous, some citrus notes, orange, caramel, medium carbonation. UPDATED: JAN 11, 2019 Très bonne Double IPA alsacienne, une amertume très prononcée qui reste bien en bouche. Presque parfaite. Van 't vat. Amber/oranje kleurig bier met wit schuim. Geur: hop, wat biscuit, licht zweterig, wat pompelmoes, wat citrus. Smaak: hopbitter, wat harsachtig, pompelmoes, wat citrus, wat karamel. Volmondig. Medium koolzuurprikkel. Afdronk: hopbitter met een leuk hop pufje/boerke. 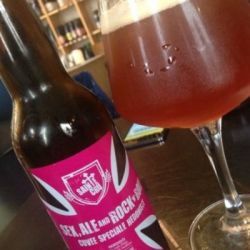 UPDATED: JUL 1, 2018 33cl Bottle @ Saveur-Biere, Lille, France. Amber colour with a thin white head. Aroma is hops, citrus, fruits, grass. Taste is hops, citrus, grapefruit, resin. Medium body, average carbonation. 330ml bottle from V&B Annecy. Pours a misty reddish amber, small foamy off-white head. Fruity aroma with grapefruit, blood orange, citrus. Taste has similar elements, robustly hoppy with an edgy bitterness.. a bit sweet but ticks the boxes for a hoppy DIPA. Bought @ Voges! 2017 Nice IMP. Aroma is rich but a tad too light as is the taste. Nevertheless a very pleasant beer. Very yeasty. Nice mild hops. Full creamy palate. Aftertaste is smooth. Bottle from Terre de Boissons Calais and drunk at home. Clear amber colour lasting white head. Hoppy citrus grapefruit aroma. Some malt to the backbone. Hop is entertaining. Some pink grapefruit some sherbet. Moderate bitterness on the finish. Pretty tasty ipa. Good hops.